Looking a little disheveled? Need to get yourself all polished and poised but those wrinkled and crease ridden garments make you look a little worse for wear? Its time for a new clothing iron and Bosch makes the Premier Power Steam Iron that might help you ace that next interview. The Bosch TDA7640GB Premier Power Steam Iron has many general functions and features that will help with your day to day ironing routine. Its powerful Advanced Steam System has a high output of steam and optimal distribution thanks to its Palladium Glisee ceramic sole plate with three phase design. Having 5bar steam pressure and 40g/min steam output, moistening your fabrics is a cinch. With its triple zone technology, this iron moistens, dries and smooths as it gently glides over your fabric. The refined placement of steam channels gives this iron easy accessibility to the most persistent creases. A lightweight design weighing in at a mere 1.2kg, makes using this iron fairly easy. It comes with a 3m cord as well which makes moving while ironing effortless. You will never have to worry about being wrapped up in the iron. Getting wrapped up in ironing is a completely different beast in itself. 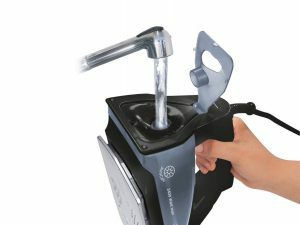 The Bosch TDA7640GB can hold 400ml of water in its reservoir which is just above average but it does go through the water quickly because of the Advanced Steam system. With that said though, the Advance Steam System does help target creases and has deeper water penetration. 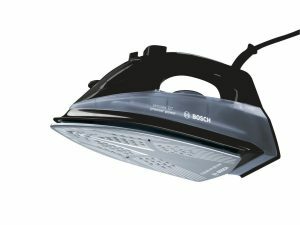 Bosch has incorporated a self-clean and Anti-Cal system that not only will keep the buildup of calcium to a minimum, but it adds to the longevity of the iron itself. No clogging means a better steam and that is what gets those wrinkles out! This iron also features the built in Drip Stop feature. Claiming to keep your iron from leaving unwanted water spots and stains, the Bosch TDA7640GB Premier Power Steam Irons Drip Stop feature works on every temperature setting, which is something many irons don’t do. It accomplishes this by controlling water flow to the steam channels. The overall function of the Bosch TDA7640GB Premier Power Steam Iron works well, but the design of such items as the temperature dial and steam buttons are well below subpar. One of the largest complaints is that these either fall off or wear quicker than most. Perhaps this is a small price to pay for an iron, but many believe that a Bosch should be more sturdily built. The handle is quite uncomfortable as well, and anyone with hand issues like arthritis will have difficulties holding this iron comfortably. But one of the biggest and most interesting complaints is that an iron at this price point and with such a reputable brand name, does not have an auto shut off feature. 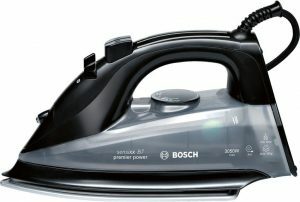 Sure a lot of irons don’t include this, but its surprising that the Bosch TDA7640GB Premier Power Steam Iron doesn’t! If you are looking for an iron with true technology based features that add to the power and reliability of a small household appliance, the Bosch TDA7640GB is a safe choice. With its simplistic design and relatively easy to read dials, its an iron that will get the job done with not much fuss. It does come with a 2-year warranty which definitely will come unhandy if the dial or buttons fall off, so you are not really going to be out anything in the long run. It does the job right and has a few extra features and benefits. Either way, having an iron that helps keep you polished and professional, is a good purchase.